RCCostEur - Your Vacation, Perfectly Planned! 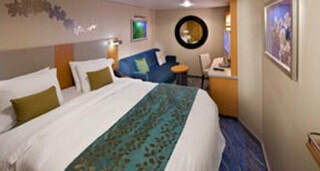 Stateroom Features: 6N - Ocean View Two twin beds that convert to a Royal King bed. One double sofa bed in staterooms. One Pullman bed in staterooms. Stateroom: 179 sq. ft.
Stateroom Features: 2N - Ocean View Two twin beds that convert to a Royal King bed. One double sofa bed in staterooms. One Pullman bed in staterooms. Stateroom: 179 sq. ft.
Stateroom Features: Central Park View Balcony Two twin beds that convert to Royal King. One double sofa bed in staterooms. One Pullman bed in staterooms. Sleeps up to 5 guests. Stateroom: 182 sq. ft. Balcony: 52 sq. ft.
Stateroom Features: 6D - Ocean View Balcony Two twin beds that convert to a Royal King bed. Stateroom: 182 sq. ft. Balcony: 50 sq. ft.
*All staterooms and suites come complete with private bathroom, vanity area, hair-dryer, closed-circuit TV, radio and phone. Stateroom images and features are samples only. Actual furniture, fixtures, colors and configurations may vary. These are Standard Group Rates for the category. Other room categories may be available at different (some lower) prices. You may be eligible for even lower prices based on your military/veteran status, age, State of residence, past guest status, promotions in force, etc. Some room categories and/or rates listed above may not be available at the time you are ready to book if those categories are sold out or are not eligible or available for current promotion. Please supply information requested in the Booking Request Form and we will search for all discounts and promotions available to you. ​Other categories, not listed above, at other (sometimes lower) prices may be available. When you are on the phone with us, please ask about them and we will look for and share them with you. NOTE: Families of over 4 persons in one room can be accommodated in a Family Suite, if available. This booking can be priced and booked only on the phone, so please talk with us about a Family Suite booking if you wish to have more than 4 persons in your room. Group #81834-JADAR FAMILY MEDITERRANEAN CRUISE 2020: 7-NIGHT W Mediterranean on Allure of The Seas - July 12, 2020. *Prices are per person, based on double occupancy. Third and fourth person in same room may pay a lower fee. Government Tax & Fee of $130.66/person is not included and must be added. Gratuity and optional cruise insurance are not included. A standard deposit of $250.00/person is required at booking unless otherwise advised. After your cruise is booked and a deposit is made, you are eligible for JADAR's FREE Monthly Payment Plan, if you select that benefit. Questions or comments? CLICK HERE to contact us. Read our Policy covering trip cancellation and refund.